alien rants: What's immigration got to do with it? 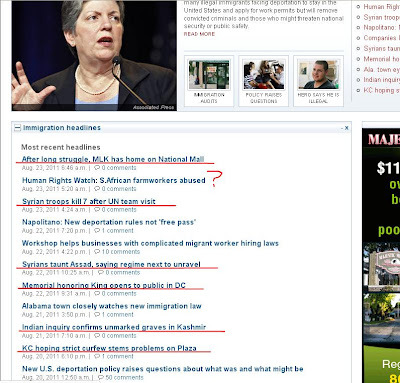 I tend to keep an eye on immigration issues by watching the on-line newspapers around the country. Above is a screen shot from one such newspaper. As you can clearly see below the mug of Big Sis it says, "Immigration headlines." But take a look at what they've chosen to throw in there. Sure, the immigration topics are there, but so are stories about Syria and MLK and "unmarked graves in Kashmir." Whenever some skinhead goes on a rampage, it ends up in the Immigration index. Like the Giffords shooting was indexed there. I've complained to the paper, but they have a history of not responding to anything. The newspaper used to be a bastion of conservatism in the reddest state in America, but they took an editorial view with their owners in favor of amnesty. The rag is the Deseret News of Salt Lake City.